Ancient knowledge. Timeless values. A universal story for humanity today. A documentary film about the Afro-indigenous Candomblé spiritual culture in Bahia, Brazil. Grounded in strong community and Earth-based wisdom, Candomblé is a potent legacy of enslaved Africans in the Americas. ​through the voices of extraordinary women leaders. Winner - Best Historical Documentary ! We are deeply saddened by the recent passing of great Candomblé leader Mãe Stella de Oxóssi to the ancestral realm. Her wisdom and love are eternal. Our film aims to divulge Mãe Stella's dedication to the rights of humanity and nature. 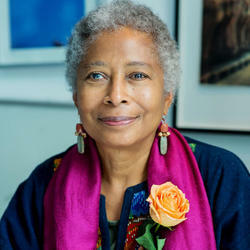 We are forever grateful to great writer and activist Alice Walker for narrating our film's story. now in its direst hour, most needs, I am humbled and, yes, amazed. For this is what Truth means. No matter how hidden or abused, how enslaved and denied, ​it survives. For a full list of screenings, please see our Screenings / Eventos page. English Promo from Donna Carole Roberts on Vimeo. ​"It is so overwhelmingly powerful!....Not since watching the film Daughters of the Dust have I seen such compelling visual images of Black women as ​institution builders, knowledge experts, and authoritative leaders (meaning not solely figureheads) in an African or African diasporic context." (see web page, Casa de Iemanja) and DVDs for private home use, please contact D. Roberts, as below. Support our continued work promoting both original versions of the film with a gift from our project. Please donate using PayPal via the "Donate" tab above, or call/email us to use a credit card without using PayPal. If you wish to make a 100% tax-deductible charitable donation, please contact us. This is possible thanks to our fiscal sponsor, Pittsburgh Filmmakers. with memo "Yemanja film". All photos on this site are copyrighted and cannot be used without permission. If you would like to use any content of this site, please contact Ms. Roberts. We are very happy you are interested in our work and will respond in a timely manner.